"My daughter just loved the speech, the people clapped, it was laughter and I can tell you it would not have happened without that opportunity to have that guidance and direction from that. It was amazing." Click the play button to hear Peter! 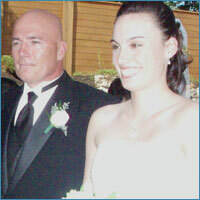 You wanted to have an audio testimonial to let you know how I went with the wedding speech. It was just a tremendous opportunity to give an understanding and… to be able to structure my speech in a manner that was going to be meaningful and helpful and interesting. It did exactly that. My daughter just loved the speech, the people clapped, it was laughter and I can tell you it would not have happened without that opportunity to have that guidance and direction from that. It was amazing. I never had an experience like that before and I wouldn’t have been able to do it without that help that I got from you. I just thank you so much for the direction and the clearness and the clarity with which I was able to structure my speech on the day. I’ll send you an email…a photo when I get the photos onto my computer. So thank you and I’ll be in touch. Good afternoon everyone and welcome, Today we participate in a wonderful tradition, the union of two individuals Fred and Rayda who share with us this day their very special celebration of the Holy Sacrament of Matrimony. A very special recognition to the brides loving parents Rayda and Herman and warm appreciation to our wedding party for making this a very special day. Okay, I did some research and discovered that the Best Man’s speech has three main parts. I remember one particular occasion when Fred would drive me in his 1969 Pontiac Firebird to high school back in what must have been the winter of 1977 – 78. One cold winter morning as we were coming up to a major intersection cluttered with, Big- couldn’t miss them, Yellow, School busses the light at the intersection was about to change from Yellow to Red. We were driving along and listening to Fred’s “don’t touch my car stereo”, and rapidly approaching the intersection, you know the one with the big yellow school buses. Fred quickly calculated the distance; speed and more importantly the ever decreasing gap between the buses and decided he can make it. Got to love that can do spirit of his. Appropriately for this occasion was one of Fred’s favorite songs by an artist named Meat Loaf “Like a Bat out of Hell”, And so we were gaining speed and slaloming our way between the busses until we hit the middle of the intersection and a nasty patch of black ice. Suddenly I began expressing a few choice expletives as the Firebird began to spin around and around in the midst of morning traffic and those big yellow school buses. Recovering from what seemed to be our death spiral we very luckily proceeded through the intersection with no harm to persons or property. Now traveling at sub light speed and with Meat Loaf at the end of his song I looked over at Fred with great disdain and all he could say was Cool. Looking back it was cool, and being with Fred throughout my youth was cool he always managed to bring some challenge or excitement into our lives. Like the time he accidentally stabbed me behind the ear with a pen while pretending to be a knife thrower in the circus, or the time he accidentally put a rusty nail through my hand while sword fighting with pieces of molding we found in the garage or the classic time he managed to set his own leg on fire trying to wash paint off his leg with gasoline a bit too close to the BBQ. Fred’s nickname, which my father gave him, was Super Genius, do you wondered why? There are dozens of stories like these about Fred, which we can now look back on and laugh… only because we have survived. Rayda you are now Fred’s co-pilot and he couldn’t have picked a better partner. Your journey together will be exciting so bring your nerves of steel and your great sense of humor you will need them both. Let the love that you feel for each other be a key component of your first aid kit. Fred you are truly the Best man here today and you will always be my best man. Your generosity and compassion is unmatched your influence in my life has been a catalyst for my achieving many of the things I am most proud of. When I look at Daniel and Ethan I remember our childhood together before the loss of innocence when girls were still yucky and riding our bikes together was time very well spent. Fred and Rayda we love you both as does your whole family and I am sure Our parents are looking down from heaven with great love an admiration on this day, the day that the two of you have become one. Card #1. On behalf of the bride & groom. I want to thank everyone here for sharing in this special day. The first thing out of my mouth was ---- what about our permanent T-time on Sunday morning? Card#2. But seriously -- When I first met Susan I liked her right away -- she was easy to talk to and down to earth. I knew she was good people. I knew Mike had a keeper, I just didn't think it would take him 7 years to ask her to marry him. Card#3. 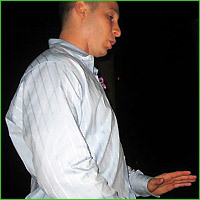 Mike -- I want you to know that I have been honored in serving you as best man. That the two of you will have a lifetime of loving memories. Here's to a new beginning -- A life of happiness, health, adventure & love. "I would recommend Weddingspeech4U is because it really gave me the courage to say what I wanted to say and articulate it in a way that I hadn’t really thought of articulating it"
Hello, my name is Diana from Sydney, Australia. I haven’t actually had my wedding yet but I actually used the wedding speech for my engagement speech, I kind of varied it a little bit and used it for my engagement speech. Basically, the reason that I would recommend Weddingspeech4U is because it really gave me the courage to say what I wanted to say and articulate it in a way that I hadn’t really thought of articulating it. Getting the speech, or the speeches, really helped me figure out what it was that I wanted to say and just how to say it in a way that made sense and really got across the feeling that I wanted to get across. I thought it was absolutely wonderful, and I think the biggest benefit came in terms of the fact that I was incredibly stressed on the day of the engagement party, and it wasn’t until the morning of the engagement party that I actually thought “Oh my goodness, I’m going to need help with my speech”. "I was the star it was just fantastic people really appreciated my effort." "weddingspeech4u saved me on my daughter's big day"
weddingspeech4u" saved me on my daughter's big day, November 25, 2006. For a year before her wedding, I really wanted to (and knew I should) stand up & give a speech for my daughter and her new husband, but I was scared, and didn't really have any speech prepared that I really felt comfortable with. I did have some ideas rolling around in my head, but I didn't really know how to put them together in a speech, if it was appropriate, and complete, and cover all of the areas that I should on that special day for her. After reading your book: “ Father of the Bride Speeches”, including the numerous example speeches, was able to put my ideas down on paper in proper order, and added the missing parts to make a very good, amusing and most of all heartfelt speech that was loved by all. After the speech was over & I sat down, several family members and friends (including the groom’s parents and grand mother) came to me to say how much they loved it, some even said they were in tears laughing at the humorous parts and brought to tears at other parts. One person (my brother) even asked if I wrote the speech myself, or had a professional speech writer write it for me! I did it! , with your help, and felt comfortable standing up & doing it! "My speech was great! I had all the guests in laughter and tears." much the book helped. I gave me the jumpstart I needed it. I was having writer block for a while. "I would recommend WeddingSpeech4U to my family & friends, because it gave me the confidence and ideas I needed to write a thoughtful and meaningful speech. " Click the play button to hear Deborah! 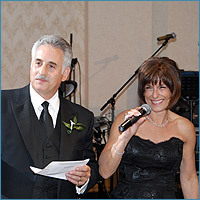 My name is Deborah Vinson, and I wanted to take this opportunity to thank you for helping me write a memorable speech for my daughter Amanda's wedding. 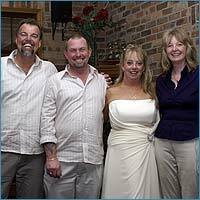 I would recommend WeddingSpeech4U to my family & friends, because it gave me the confidence and ideas I needed to write a thoughtful and meaningful speech. I found WeddingSpeech4U to be beneficial because not only can Iuse this for speeches, but it also has many other useful purposes. It contains quotes, poems, jokes etc. that I can incorporate into my scrapbooking and memory preservation. 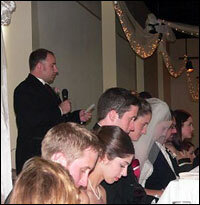 The most useful aspect of WedingSpeech4U is how it helped me put the elements of a proper speech in order. 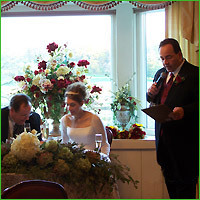 WeddingSpeech4U eliminates the guesswork and worry that's involved in preparing a speech, and allows the confidence and sincerity to shine through. "Thank you for providing me with such worthwhile material that made my job so much more enjoyable and that much easier." 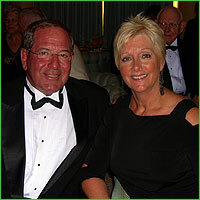 Click the play button to hear Lynda! My name is Lynda Eldridge. 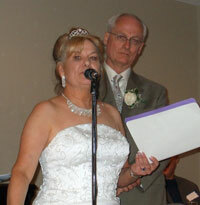 I was honoured that my daughter asked me, the mother of the bride, to speak at her wedding. The picture I have attached to this email is of her stepfather and me. It was not taken at the wedding but a few months after during a European Cruise as a perfect end to a wonderful year of wedding planning. Although excited as I was to welcome my new son in law into our family, I was somewhat apprehensive to speak to over two hundred guests at the reception. I didn't want to let my daughter down and make a fool of myself in front of so many people. I knew what I wanted to say but I felt I needed some help in the wording. I would highly recommend the Wedding Speech 4U program as it comes with so many samples of speeches given by others that it is vitually impossible to not come across a speech that closely resembles what you want to say and the feelings you want to convey. I think the biggest benefit I gained from the program that is offered by this website is the confidence that I had that evening. My thoughts were presented in a coherent and logical way that others commented later they enjoyed listening to. After practising my speech a couple of times in front of a mirror, I was able to talk to the guests from my heart and relied on my notes only a couple of times. When I purchased the Wedding Speech 4U program I knew I would also be getting an additional 10 speeches and ideas for wedding showers and/or bachelorette parties. The ideas were useful, current, humorous and very helpful and I passed these on to the people responsible for the planning of these additional festivities. If purchasing a Wedding Speech 4U for an upcoming event that you have been asked to speak at, expect to receive abundant material that is both current and relevant. 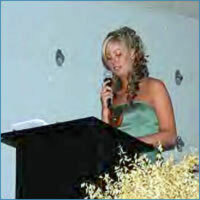 The speeches are presented in a highly professional manner and at no time did I feel I had wasted my money. Thank you for providing me with such worthwhile material that made my job so much more enjoyable and that much easier. "Reading through the speech pack, my confidence starts to build up and realised that construction of the speech is not as bad as first thought"
It was a long day but fortunately, everything went well as planned. We booked two rooms in Westin Hotel in the centre of Sydney where we did the photo shoots starting from 1.00 pm for the bridal party and later the family. At 3.00 pm, a stretched limo took the bridal party to a secluded area called La Perouse for further photo shoots. 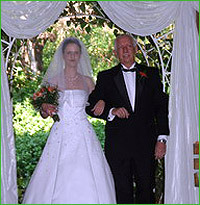 At 6.00 pm I walked with my daughter, Bonita, up the stairs into the reception at The Grand Roxy where the ceremony began. 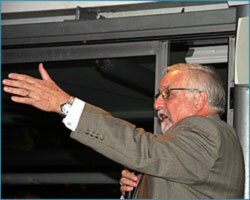 It was after the main course when the formality started with me giving the first speech. It took less than ten minutes with pauses for clapping and laugher along the way. That was followed by speeches given by the father of the groom, 2 bridesmaids, 2 Groomsmen, 2 best friends, the Groom and finally the Bride. During dessert time and while we were dancing, guests came up to me and congratulated me for delivering the best speech of the evening. I do believe they said that because I had done a good job, having learnt from FOTB4U speech pack, instead of just a courtesy call. I would, therefore, strongly recommend to anyone who needs to make a wedding speech, especially if you are father of the bride, to refer to the FOTB4U speech pack. It gave plenty of examples/templates that would suit any situation. All you have to do is to look at your own circumstances and find the most appropriate template to match them. Or you may even tailor made your own format based on the guidelines given by the speech pack. Reading through the speech pack, my confidence starts to build up and realised that construction of the speech is not as bad as first thought. It eases the fear that is mounting high on the background. But the biggest benefit I gained was to proudly say I’ve done it, even though I have never spoken openly to over 100 people before. The speech pack helped me to draft my speech. Bit by bit, they came into shape, then modifications after modifications and finally finished. I practiced by reading it aloud in front of the mirror until it comes out naturally. I also tried it on the family members. Practice makes perfect and on the big day, I was not nervous at all in delivering the speech. I don’t mind doing it again but unfortunately or fortunately, I have only one daughter to give away. "Wow! Great product, it's worth every penny." "Wow! Great product, it's worth every penny. I was the best man for my friends wedding and I totally forgot about the toast till the day of the wedding when the groom reminded me. I literally had about 2 hours before the wedding to prepare my speech, I was sweating bullets, so I did a quick Goggle search and yours was the 1st site I opened. I quickly paid the $19.95 and instantly went to the pre-written speeches, I copied and pasted parts from the 1st five speeches. Then I spent about 15 minutes editing this information to fit my occasion and wah-la. I had a perfect speech for the wedding. I spent a total of 45 minutes preparing this speech. I felt like a professional comedian because I had everybody in stitches for several minutes. Then for the rest of the evening I was a celebrity. Everybody congratulated me on such a great speech. The DJ said he does alot of weddings and that was the best toast he has ever heard. It was a truly amazing experience and I sincerely thank you for the material. Not in a million years would I have dreamed I could have delivered such a speech." "You also helped me do an analysis of the guests. For instance, why were they even listening to me? Were they searching for something special from the speech?" Your site helped me to create a wedding speech that evoked three reactions from my guests – acting, feeling, and thinking. By providing the right information about the newly married couple, I was actually able to stimulate the guests to respond. As an example, I shared a story about how my daughter and son-in-law first met, and many of the guests reached over and held the hand of their own spouse, seemed to feel a flutter of emotion for each other, as they thought back to the time when they fell in love and were married. You also helped me do an analysis of the guests. For instance, why were they even listening to me? Were they searching for something special from the speech? By performing a simple analysis, I was able to identify ways that seemed to connect with everyone at the wedding. I encouraged them to think back to their first love, or their own wedding day. As I made this connection with the wedding guests, not only did they pay more attention to the speech, but also, I had established a connection that seemed to carry through the reception. In other words, people felt as though they have known each other for years. Therefore, as the festivities of the reception began, people did seem to mingle better, dance with strangers, and overall enjoy the reception much more. "WeddingSpeech4U" was a fantastic life saver. I had left things a bit late and was starting to panic but ... to the rescue "WeddingSpeech4U"
As father-of-the-bride I didn't have a lot to do other than the financing.The speechmaking, however, came at me like a steam train. "WeddingSpeech4U" was a fantastic life saver. I had left things a bit late and was starting to panic but ... to the rescue "WeddingSpeech4U". I found the hints and recommendations very settling and used the example speeches to find the exact fit for me. Openings are usually so difficult to come to grips with but the examples 'loosened me up' and it fell all into place from there. I was apprehensive about the speech even though people were very kind about "how good it was" but I was only convinced that "WeddingSpeech4U" had saved my bacon once the video came back and I could see for myself. For me the structure, the timing and the subtle use of humour help tremendously. I was also a lot calmer than expected as I was prepared and didn't have to 'think on my feet' too much in the middle of a very hectic afternoon. Thank you for having a 'life saver' available. Recently I was invited to be the best man for my friend's wedding. 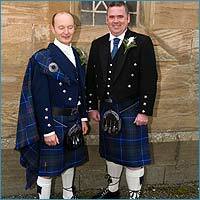 I had originally introduced the two of them a couple of years earlier and was honoured to be the best man. Although I often speak in from of small groups, I found the whole process for months ahead quite stressful. 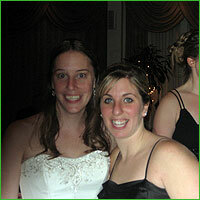 One week before the wedding I eventually downloaded from weddingspeech4u. It was certainly a breath of fresh air. After the months of trying to work out what I was meant to be saying and doing, I was fully informed in 15 minutes. 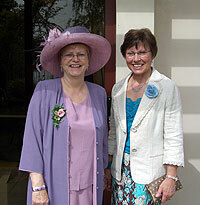 I have attached a picture of myself with the maid of honour at the wedding.
" I even had the minister's wife request a copy of it as she said "I go to weddings etc all the time and that was the best speech ever"." What can I tell you, mate. The speech went brilliantly, according to those who heard it!!! Several people came up to me afterwards and congratulated me. I even had the minister's wife request a copy of it as she said "I go to weddings etc all the time and that was the best speech ever". What I did was "cherry pick" bits and pieces from all over the place and put it together. That and a couple of ad-libs along the way worked a treat. Thank you for the documentation ...... it was a huge help in the "getting going" when one tries to start to write a speech. I have included a copy for your info. If a man speaks in the forest where there is no woman to hear him ……………………. Is he still wrong?? Good evening Ladies and Gentlemen I would like to thank you all for coming to share this day with Amanda and Lee. For those of you who don’t know …………. I am Amanda’s father the source of all her good looks, wit and charm. Then you either married it or gave birth to it!!! Lee, we welcome you into our family and the Boyd clan. I know that Mary and Ron feel the same as they have already welcomed Amanda into their hearts and their home. Pam and I are fortunate that the second of our wonderful daughters has met her match ---- and the senior service at that!! Always put the seat down. Never buy flowers after an argument with Amanda. It just proves how guilty you are. Remember the two most important words in the marriage dictionary ………………… Yes Amanda. Never use the word Dear as you may die!! Never go to sleep with an unfinished argument hanging over your head. Be a man!!! Stay awake and fight to the bitter end. Let’s face it you are on a loser anyway so you might as well get it over and done with and then get some sleep. The perfect wife is one that helps her husband wash the dishes. Be friends, trust one another and never be afraid to say I’m sorry. Lee, just one small thing ………….. Take good care of my girl. You should both be aware that marriage is an institution where the man loses his bachelor degree and the woman gains her masters. "The best part though – turns out my best man had read your book too. The speech he gave was the funniest I have ever seen and will stay with me for a very long time. " Let me just say Dan that the prospect of speaking to a large crowd of people was a little daunting to me. Add to that the fact that I was about to speak to a crowd consisting of some of the most important people in my life at one of the most significant occasions, my wedding, and it would be fair to say that I was down right terrified by the thought. A couple of weeks out from the wedding I picked up a copy of your book. What a life saver! I read the whole book in a night and was able to put my speech together the following evening. After reading your book I had the words I wanted to say but couldn’t quite get down on paper before. Come the big day and I delivered that speech no worries. It was a very touching moment - you should have seen the looks on their faces. The best part though – turns out my best man had read your book too. The speech he gave was the funniest I have ever seen and will stay with me for a very long time. " "I found it invaluable. It was worth every penny!" 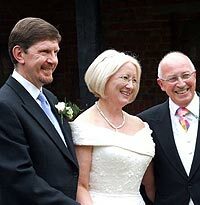 "Best wedding speech I ever heard"
"You set the tone of the entire proceedings"
"I certainly would recommend the WeddingSpeech4U to others as it provides that necessary guidelines for a father who may think he knows what’s required but really doesn’t." Thank you for your message and please accept my apologies for not responding earlier – still getting over the big day. 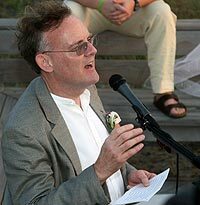 Well, as the Father of the Bride I had to present a speech on the big day and I thought I could handle this reasonably well as I had done many speeches before, but not of this type. I started earlier about three evenings before the event and did not expect to have so much difficulty in finding the right words. I had a draft which was read by my wife but we weren’t too happy and started to rewrite the whole thing. Then my son had said that you can get help on the internet with speeches previously prepared by others. Anyhow I started to get desperate the night before as I did not quite finish and in the end late at night went on the net and came across your site and purchased the packaged and proceeded to finish the speech. With so many speeches to read and little time, a majority of the speeches and the guidelines given certainly helped us put the final piece together. Although I did not use word-for-word, the main theme was there and without the speech pack it would have been a bit of an un-composed drag. Your guidelines as to what was expected from the father of the bride were the most important and these helped me put it all together. The words within the body then slowly came out and on the day it was all perfect, even ad-libbing and adding some unscripted verses at a couple of spots did bring some laughs. I certainly would recommend the WeddingSpeech4U to others as it provides that necessary guidelines for a father who may think he knows what’s required but really doesn’t. "I knew that my talk would be received by an enthusiastic crowd that would loved me, and my words would let them know that I loved them back." Click the play button to hear Blanche! This is Blanch Sherman and I would like to recommend the Wedding Speeches speeches for you to others. As that day of the wedding seems to come fast, as the days fade away and you are trying to get through all the to do's on your list, it is difficult to get your head around what the appropriate thing to say is and you feel the pressure building. Of course you want to make a wonderful impact, it is difficult to know how to make a speech because of all the ongoing distractions. Creating a speech that was warm witty and meaningful was my intent. By viewing many speeches I could formulate and associate exactly what I wanted, I could identify this situation from one speech and that situation from another from the 10 speech package from the ebook. It even gave me great witty things to say. There were great phrases and different prospects. When all put together I thought my speech was a wonderful piece of art. I prepared my speech in advance, read it, and then re-read it. I practiced on my speech just like I was coached in wedding speech for you. I made a note to pause when standing in front of everybody and looked people in the eye and smiled. Along with that it seemed my self confidence grew and my nerves stabilized. I think it was because I knew that my talk would be received by an enthusiastic crowd that would loved me, and my words would let them know that I loved them back. I knew I could do this eloquently. My sister heard that I was going to say a little speech and she thought it was gutsy of me. Believe it or not, that gave me confidence. I love doing things that others have not done before, and doing them well. I had a guest who is a consultant, she told me that I was a gifted natural public speaker. Never before have I ever stood up to talked to people, because of my stage fright. I think wedding speech for you, made everything simple. When you read all 20 speeches, they pretty well describe what the bride was doing and what she was coping with. I really identified being in the brides world. That's the way women are, we listen and learn from one another, and we are able to voice what is in our hearts. This is Blanche Sherman. 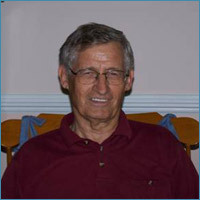 "Knowing what I know now I would gladly have paid twice the amount for the speech pack. Again, from the bottom of my heart, thank you." Let me start out by saying THANK YOU! My only daughter was married June 9th and with all the planning that went into it I knew it was going to be a beautiful event. Everything was going smooth until four weeks ago when my daughter asks if I was going to give a speech (toast). I am NOT a public speaker. So I got on the Internet to do some checking. I was very reluctant to buy your program because of a previous course (not yours) that I was disappointed with. After going back and fourth for a couple of days I finally clicked the "Buy it". That evening I started printing your program. To begin with I received more than I expected and it was easy to follow. By the time I got through most of the material I was a happy man. By the time I got through all of it I was excited! Two days before the wedding I was feeling relaxed about the speech. I followed the advice and by the wedding day I was ready. I could not believe how well it went (neither could my daughter). I would absolutely recommend your program, and have already. I had the confidence and poise to give a wonderful speech and was even comfortable enough to enjoy myself in front of an adult audience. I really can't thank you enough. Since I'm not in public speaking I don't know if a professional would benefit from your program, but if you're not a professional speaker I sincerely believe it will be a tremendous asset to have this on your computer. Knowing what I know now I would gladly have paid twice the amount for the speech pack. Again, from the bottom of my heart, thank you. Your speech pack made my speech, at my daughter's wedding, memorable...in a very good way! "My wife said that every lady there voiced that they wished their husband could have given such a speech." I am writing to thank you for the book “WeddingSpeech4U” that I recently downloaded from your web site. I just returned from my daughter’s wedding and I must say that without your advice, I would not have been so successful in my “Father of the Bride” speech. I believe the biggest benefits found in your book include the segments on how to put together a speech that not only gets audience attention from the start, but allows you to tell tasteful stories about your daughter that will forever be favorably etched in her memory. 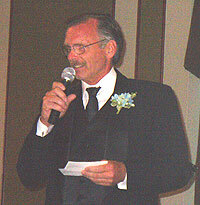 Many that attended the wedding stated that my speech was the best they had ever heard. My wife said that every lady there voiced that they wished their husband could have given such a speech. All I know is that both my wife and my daughter sincerely appreciated my words, and that is all that matters to me. Without your help, that would not have occurred. I highly recommend this book. Not only does it effectively, yet concisely, explain what makes a great speech, it is modestly priced and easily downloadable for rapid access. Thank you again for making my effort the best it could be. "The biggest benefit was the confidence I gained leading up to my presentation, knowing that I was prepared and on target with my message." Click the play button to hear Harold! 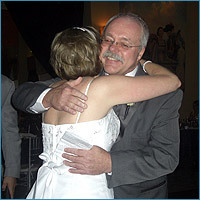 I whole heartedly and without reservation recommend your wedding speech for you speech pack to every father of the bride. The weeks leading up to the wedding I kept telling myself that I would compose my speech tomorrow. 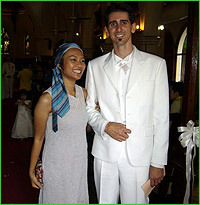 It got down to that the next tomorrow was the actual wedding day, I turned to the internet for help and found your website. The speech pack I received was a great source of comfort and it allowed me to organize my thoughts and blend them with some of the examples you supplied. The biggest benefit was the confidence I gained leading up to my presentation, knowing that I was prepared and on target with my message. I can't begin to tell you how many dad's complemented me on my speech. The speech pack allowed me the freedom to focus on wedding day details and not be distracted by my father of the bride speech. Again, I would like to recommend to anyone having concerns of difficulty in preparing a wedding day speech to purchase the packet. The information on how to organize your thoughts and notes and the contents found within the samples made it a very easy and enjoyable task. "With the confidence of having a basic structure I was able to create a meaningful, heartfelt speech that was a joy to deliver and which earned me many congratulations (especially from the Bride and Groom)"
As you can probably see I am not the father of the bride. I was asked by my friend of 26 years (Susan, the beautiful woman in the middle) to give her away. Her father having passed away many, many years ago. What to say? Blind panic! I was going to have to make the first speech at the wedding and I hadn't a clue what to say or how to go about writing or delivering a speech. I had to give away an older woman (who is not in the first flush of youth - but she will flush again) and I was not the Father-of-the-Bride. More Panic!!. I logged onto the internet and came across your website - thank heavens!!! Although, none of your speeches fitted my situation they did give me a sense of the style, content and presentation a speech should have. I was able to use your format and hang my own words and sentiments on the structure. Thanks for the pointers and help. I couldn't have done it without you. "Even the day after people were still talking about my speech - I can hardly believe it." I have to say that I was very pleasantly surprised at how helpful your product was. I read through all the advice before I started to write my speech. As my husband died two years ago I new that it was going to be very difficult for us all. However, after I had put together my speech, I then left it for a few days. When I came back to it I new that I had to re-write some parts and then rehearse. My other daughter was expecting a baby (only two weeks prior to this wedding) so I had to be well prepared some weeks ahead. I rehearsed several times with my grand-daughter and then my pregnant daughter who both said the speech was fine. I also re-typed it so that it was clear where I needed to pause etc. and once again followed your advice to keep reading it over. On the day I gave my daughter away and also did a reading at the ceremony. Whilst I was understandably nervous I knew that I was well prepared and that I'm sure came across to people as I presented what I had to say. The Master of Ceremonies said my speech was "excellent" and I had numerous people come up to me afterwards to say how good my speech had been and how much they had enjoyed it. One lady said she had a friend who had lost her husband some while ago and was now in the same situation as myself with her daughters wedding so I recommended your site to her. Even the day after people were still talking about my speech - I can hardly believe it. The photo is of me (in the big hat!!) together with a friend who new my husband and had known him since childhood. She said later the same night how proud he would have been of us all and how he would have enjoyed the speech I gave. I can't thank you enough and would recommend your book to anyone and everyone. It was worth every penny!! "Groom: Thanks Doug that was a really good speech, just what I thought you'd be capable of"
"Bride: Thanks Doug that was really funny and very appropriate I did dread what could have been said, but you got it spot on"
Just returned from a trip to the UK (I live in Australia) to be best Man at my brothers wedding. I felt quite confident that I could do a good job however to be on the safe side I bought your info on speeches on line. I was glad I did as it gave me a bit of a safety net if I either ran out of time or just could not get it together. The info you sent was very useful indeed it was more than I thought I was getting in terms of the amount of information about etiquette, toasts etc. The up shot was that I was able to write a good funny speech which went down very well indeed at this very traditional Scottish wedding. The feedback I got from just about everyone was fantastic here is what some had to say. Groom: "Thanks Doug that was a really good speech, just what I thought you would be capable of"
Bride: "Thanks Doug that was really funny and very appropriate I did dread what could have been said, but you got it spot on"
Mother of the Bride: "that was so funny I am still laughing at the one about the upper hand"
Brides Father: "well done Doug very funny indeed, good Job"
Friend of the Groom: "Well done big fella that was one of the best I have heard"
Videographer: "well done, I have seen so many people get the best man speech wrong, but that was very good"
Grooms Mother: "I am pleased you kept it clean and still managed to make it fun and sincere"
Over all it went very well and I am pleased I got your download, I have directed at least 3 people from the wedding to your site on the basis of my speech. I have attached a copy of my speech for your records. Thanks again your website and down-load really did help me out. P.S. in the photo I am the one on the right, the groom Jim is on the left. We flew from Cairns to Canberra for the weekend to attend our best friends' wedding! My partner was 'Best Man' and was in no way prepared for a speech. On the morning of the wedding we rushed to the nearest internet café and searched for wedding speeches. We found an appropriate one on your website and downloaded. With a couple of hours to spare and a little tailoring the speech was ready. At the Reception the Best Man made his speech and was received by a standing ovation and applause from the audience. The groom was a little red faced and was later quizzed about his activities alluded to in the speech. This made his day. Talk of the best mans speech resounded through the evening. I can say that you definitely saved the day. We would definitely recommend you to friends as your speeches are relevant and realistic and only a few words are needed to personalise them. The biggest benefit we got was finding a great speech that we could easily use, given that we only had a couple of hours to spare. The speech helped my partner no end as he is not into public speaking but he found it had been worded and put together well and stopped him from getting flustered. We got a fantastic speech (found in only five minutes on your website) that was easy to use, was relevant to the situation and was an affordable price too. When it comes to looking after your friends you did a great job and others will gain the same. Here we all are. Line up from left to right. 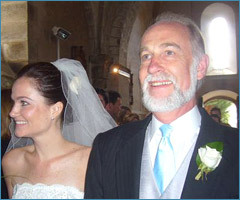 "The wedding was a huge success and my daughter even asked if she could have a copy of my speech..."
Your information and Father of the Bride download helped me to write a wedding speech that was very easy to present. I thought that I would be nervous to present. I was able to focus on the matter that I wanted to put in the speech rather than the format which was clearly layed out in your material. I was able to introduce some things that a lot of the people were familiar with since my daughter and her husband are Skydivers and may people in the audiance were skydivers as well. For example: I said Doug has some advice for all of us as an experienced skyddiver.There is a saying that says. If at first you don't succeed try and try again. However this does not apply to skydiving. All in all the wedding was a huge success and my daughter even asked if she could have a copy of my speech. Many people came up to me and commented that the speech was excellent. Thank you so much for the info from your site, it saved me a tremendoes amount of worry and anxiety. "I was able to piece together my speech using my own material and selected parts from the sample speeches and jokes included so a big thank you!" I spoke at my daughter's wedding here at our house in France last Saturday, Sept.1st and I have to say that it went very well indeed and I was congratulated by a lot of family and friends, we had over 150 at the wedding. I really only got around to preparing my speech a little over a week before the big day and found all of the material you sent invaluable. "After the speech I had 15 to 20 people come up to me and shake my hand, some wives said they wanted to copy my speech and give it to their husbands so they would be prepared in the future..."
I downloaded all the speeches and read through them trying to choose which one I thought would be the quickest and easiest to manipulate into a speech that would work for me. I ended up saving speech #1 in word and made a few but not too many changes. At lease I had something somewhat prepared two days in advance of the wedding. When the evening of the wedding arrived I was prepared to say something, nothing fantastic but I felt it would do the trick. I had tried to memorize it but it was a little too long so I printed it out and made sure I had it in my coat pocket. When it came time for me to do my thing, I got up in front of 80 attendees and did my best to not read it but say it with some meaning. To my surprise people were cheering and laughing as I did my best. After the speech I had 15 to 20 people come up to me and shake my hand, some wives said they wanted to copy my speech and give it to their husbands so they would be prepared in the future for similar events. 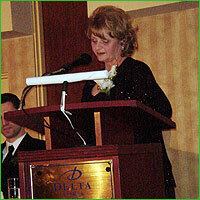 To my amazement I had several people compliment me on the speech the following day. I really felt good about the whole thing. No one even knows I used most of the original speech #1, they all think it came from me being so well prepared and pouring a lot of thought into it. Thank you very much for being there when I needed you. This was the best money I’ve ever spent. "Thank you for your help in making our wedding speeches successful!" I purchased your package for Mother of the Bride. It was most helpful for thought starters and to help my very nervous husband put together a very excellent and engaging wedding speech. I have provided a picture of my husband and I at the reception delivering our heartfelt comments. Thank you for your help in making our wedding speeches successful! "...The help with the bachelorette party ideas were awesome, the shower ideas, the sample speeches, the how to battle the nerves..... all of it. AMAZING! " Just this past weekend I spoke at my cousins wedding doing the Toast to the Bride speech. It went so amazing. I got so many compliments on it. I never thought I could prepare and read something so beautifully. It was great. I am so proud of myself. With the help of your package I bought online I was able to get the ball rolling. Before I purchased it I had been at a total standstill. What am I supposed to say in this speech? Who am i supposed to talk about? How do I talk? I'm scared of talking in public. How am i going to get through this? This website helped me more than I ever thought. It helped me with all my questions and so much more. The help with the bachelorette party ideas were awesome, the shower ideas, the sample speeches, the how to battle the nerves..... all of it. AMAZING! When I was sitting waiting to do my speech I was almost having a heart attack i was so nervous but i though of all the tips that had been discussed in this package and it helped a lot. I delivered my speech so gracefully. I was talking to the bride today and she said she can't stop reading it... I'm just so proud. Thanks so much, couldn't have done it without you!!! I would definitely recommend this to anyone, it will help you so much if you are stuck or even if you aren't. It will give you direction on how to make your speech better or how to get started. Give it a try you won't regret it!!!! "This book is an excellent resource for ideas. The speech I gave was a great success and my own, but supported by this work. Congratulations on a fine resource." This book is simply great. The background, context, reasoned approach is excellent. I spend a great deal of my professional life training others in presentations skills in front of large groups and have no concerns about undertaking speeches. 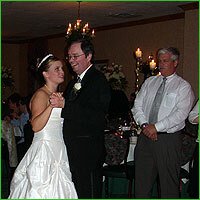 But as the father of the bride I was needing ideas, structure, and suggestions or guide for the content. This book is an excellent resource for ideas. The speech I gave was a great success and my own, but supported by this work. Congratulations on a fine resource. "I was a hit at the reception everyone there commented how well I did and that it was a pleasure to hear. My daughter is still amazed at how well I did..."
Just sending you an email to let you know how the father of the bride speech went. First of all I was very impressed with the package that was sent to me it was an immense help in getting my self prepared for the speech. I was a hit at the reception everyone there commented how well I did and that it was a pleasure to hear. My daughter is still amazed at how well I did and her friends are still talking about it to her a week after the wedding. Again thank you very much, I will gladly recommend your product to other fathers of the bride it helped to put all the words in the proper perspective and take a lot of pressure off ,and allowed me to help with other things. "I couldn’t have done so well without your clear, concise instruction on how best to go about preparing for the speech of my life!" I’m delighted to respond to your request for a testimonial on the value of your Father of the Bride Wedding Speech package. Before receiving your material I struggled for weeks trying to decide what I would say and how I would say it on my daughter’s wedding day. My wife, seeing me struggle and becoming fearful that I could not do the task alone, suggested that I hire a professional speech writer. I wanted the speech to be memorable, but more importantly, I wanted the speech to be meaningful in offering thoughtful reflections on the importance of our daughter, Anja’s and her husband, Jeremy’s commitment to each other. I believe my goal was achieved, as many of the attendees came up to me to offer their complements and thanks for a wonderful speech. And the next day after the wedding ceremony, my wife received a call from the groom’s mother, letting us know that one of her friends, whose daughter was soon to be married, wanted a copy of the speech for her daughter’s wedding. I couldn’t have done so well without your clear, concise instruction on how best to go about preparing for the speech of my life! Your Wedding package was well worth the investment. Thank you.